I was at Food Blogger Connect 2015 in London last weekend. It was a weekend of networking and learning, held in the grounds of Chiswick House in the capital. I will be bringing you a post on this soon. At the conference, I was chatting with a few other food bloggers about foodie things and the subject of sandwiches came up. We talked about favourite fillings that we liked in our sarnies and then I remembered! My friend Luca described the flavours of the ingredients as all very umami – the fifth taste – which hits a lot of savoury notes. I decided to replicate the sandwich when I got home from FBC, and luckily I had been sent some flour to try from Marriage’s The Master Millar. I was sent a bag of plain flour and a bag of their wholegrain bread flour. I made up a loaf using the golden wholegrain flour, which contains twice the fibre of white flour. The loaf was crusty, light and fluffy! I got to making the sandwich, which is fairly straightforward. All you need is some ‘spread’ – butter is fine, marge is fine, but you need a good schmear of this. Then you take a bag of ready salted crisps – I used Walkers – but any brand of ready salted would be fine. Place a good handful of the crisps atop the ‘spread’. Then you take brown sauce – mine’s was HP. Again, up to you the brand. Squeeze a healthy amount over the top of the crisps. The last part and to me, the most important. Parmesan cheese. Now, don’t go racing down to your cheesemongers as I am not using ‘real’ parmesan. 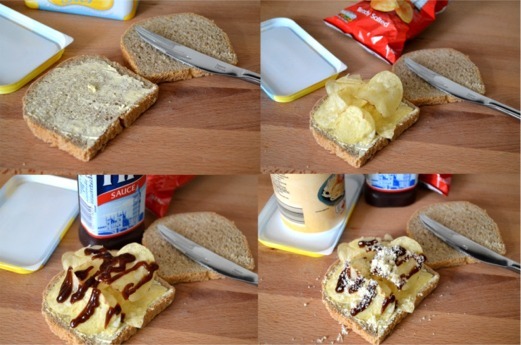 Back when I used to make this sandwich, real parmesan was not as common place as it is now. We always used the pre-grated type you can buy in tubs (sometimes described as hard Italian cheese). I always think of this as a guilty pleasure. I used to liberally splash it on tomato soup, over my pasta of course, anything I could think of. My tip – buy cheap 'parmesan'! The cheaper the more flavour I find, and makes this crisp, brown sauce and parmesan combo a real treat. Sprinkle the cheese all over the brown sauce so it sticks. Take your top piece of bread and press down lightly and there you have my favourite sandwich! If you try it I would love to know what you think!! This all brings me conveniently on to our new blogging challenge – Club Sandwich. I say we as myself and Kevin over at the Crafty Larder will be hosting alternate months. This month it is yours truly. For Club Sandwich we would love to see all your sandwich combinations. Be they proper sandwiches or toasties, Paninis, bagels, sweet or savoury, healthy or not – you name it we shall accept it! It doesn't even need to be in bread - I once saw Paula Deen make a sandwich with doughnuts as the 'bread'! Be creative as you like. Why not join our Club Sandwich this month?! I LOVE the sound of this sandwich Stuart, I'd never have thought of it but then I do LOVE 'egg and crisp' sandwiches for the textures so I bet this is a winner. Eurgh, you had me tim the mention of sauce, sorry! Fanny has a whole partwork about Sweet & Savoury Sandwiches, it's not for a wee while yet but hopefully I can link in when it come up! Good luck! Looking forward to it - pity you aren't a fan of the sauce! Love the challenge! I'll see what I can come up with. Now that does sound good - hundreds and thousand sarnies - mmmmm! A fantastic new challenge idea! Loving the look of that crisp sarnie! I just love club Sandwich.. Nd your idea is the best.. I am looking forward for some more tricks..